The Forgotten Garden begins with a small child, seemingly abandoned, on a boat headed for Australia. She claims to not know her name or why she carries with her a small suitcase containing an illustrated book of fairy tales and one single change of clothes. From this central point the mystery of who she is and where she came from is slowly revealed over a 100 year span of time. This book is all at once a family saga, a romance, and a mysterious tale of tragedy and redemption. This is a spectacular piece of storytelling and a work of fiction I can easily recommend to almost anyone. The Forgotten Garden reminds me of The Thirteenth Tale but with a much better conclusion. Morton’s method of slowly unraveling a complicated story is engrossing and I had a hard time setting the book down each night. By far my favorite book of the year and one I can see myself recommending for years to come. 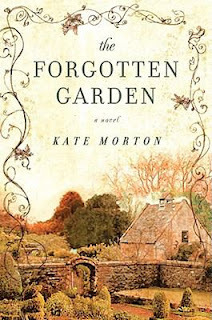 Thanks for sharing the review of The Forgotten Garden. I found it interesting. Will order my copy soon.